Pregnancy | Fighting the Invisibility - Living with M.E. My pregnancy went by more smoothly than I’d anticipated (is this anticipation of complications in all areas of life, a result of how deeply my illness has pervaded my psyche? I would have to say, probably…). I was regularly seen by a consultant at our local hospital, and he was a truly amazing doctor. He realised that he had limited experience of obstetrics where ME/CFS is a factor, so he sought repeated advice from my GP, my ME/CFS specialist and the head of the anaesthetics department. I saw him every 4 weeks from my second trimester onwards, and he approached all my birthing concerns with such open-minded candour that I could have kissed him at every appointment (I didn’t however, as I didn’t think the “pregnancy hormones” excuse would suffice). I originally agreed to try for a vaginal birth, with an epidural as soon as I was in established labour. I was extremely worried about whether my energy levels would hold out after the birth, or whether I’d crash completely, never to recover again (my husband accuses me of “catastrophic thinking” at times, and on this occasion he was probably justified). But I was set on having my baby through a normal vaginal delivery. As fate would have it, in the month before I was due to give birth, the TV programme “One Born Every Minute” aired on UK television. It’s a reality show that is filmed in a busy maternity unit, and shows 2-3 births every week. After watching an episode where a woman was in “early labour” (only 2cm dilated with irregular, though painful contractions) for 3 days, my husband turned to me and asked whether I would consider having our son by elective c-section. I had never considered that early labour could last as long as that, and that it would be as draining as it clearly was for the woman we saw on the show. Our contingency plan with the obstetrician had been for an epidural once I was in established labour…but what if I was so exhausted from early labour that I’d be too tired to push, and need a c-section anyway?! So, at our appointment the following week, we highlighted our concerns and asked about the possibility of an elective c-section. The consultant agreed to the c-section as there was no way to tell which option would be the “right” choice for me, so he was willing to be guided by my wishes. 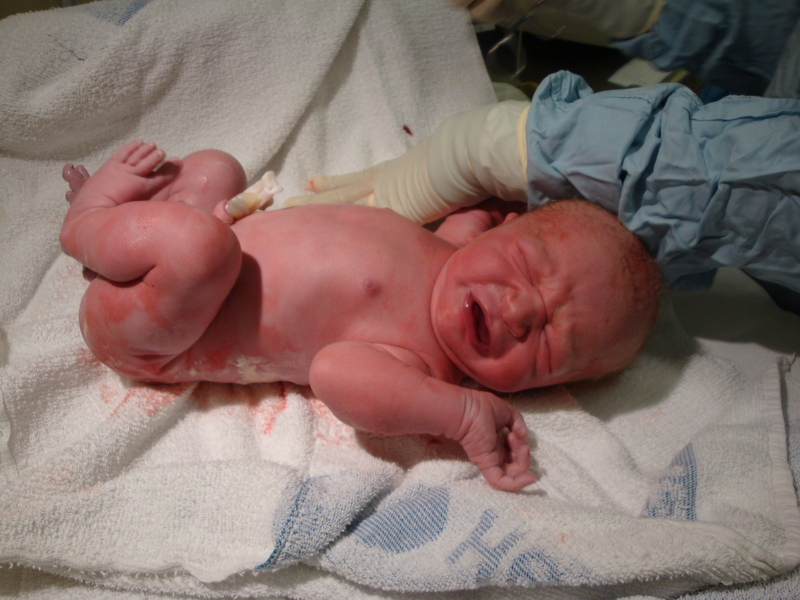 My elective c-section was a wonderful, relaxed experience and went as smoothly as expected. My energy levels never even dipped for a moment, and I was walking around the ward 24 hours later with my beautiful son, Ethan, in my arms. I enjoyed my maternity leave, going out and about with Ethan 2 or 3 times a week. I coped well with him on my own, and as my energy levels remained so well, I even allowed myself to hope that I might not crash again – that my pregnancy had “cured” me. Despite everything that I know about my condition, I dared to dream. And then that dream was shattered, as so many of my dreams have been shattered by the ME/CFS monster. I had decided to take only 6 months of maternity leave, so at 5 months old, we started Ethan on some “settling in” sessions at the local nursery. Leaving him there, even for 2 hours, initially, was far tougher on me than on him. He settled beautifully, and was always so content when I arrived to pick him up. But, as any parent knows, when starting at nursery/school for the first time, our child’s immune system comes under attack from every virus known to man. Ethan was no different. And being the sweet child that he is, he willingly shared them all with me. I was constantly sick. Just as I was recovering from one virus, the next one struck me down. I even missed my official start day at work as I was so unwell. The constant barrage of viruses finally resulted in a major relapse of my symptoms, and 12 months later, I’ve still not recovered. I managed to start back at work, but wasn’t able to do very much when there. My fatigue was unpredictable, and my brain fog was constant. I could probably count the number of days I worked in the first 6 weeks after my maternity leave ended on one hand. And, in early March 2011, I finally listened to my body, and went off on long-term sick leave. I felt so defeated (even cheated) that I’d been so well for so long, only to be jolted back to reality with a bump. No, an earth-shattering, soul-destroying thwack! Oh, reality, how merciless you can be. I have had a cold/flu virus since Christmas, and it just isn’t shifting. In fact, every time I think it’s getting a bit better, it relapses and gets WORSE! It’s driving me bananas now! It’s gotten to the point where I can only sleep about 3 – 5 hours a night because I’m up so often because I can’t breathe through my nose! This stupid virus (as usual) has flared up all my ME/CFS symptoms too! And because of the pregnancy, I CAN’T TAKE ANYTHING that might make me feel better or help me sleep through the night! So, I’m just miserable now! I sent Chris off to the pharmacy to get a recommendation on anything that I could take that is safe in pregnancy, and none of the pharmacists will commit to recommending anything! Their stock answer is: “Speak to your midwife”. Great. The midwife’s office is only open for non-urgent enquiries on week days, and when I have spoken to her before, she only really recommended a humidifier…which we’ve ordered online and are waiting for the delivery. But I need something NOW! This is really getting me down! Sorry, this post is really just a way to let me vent. Thanks for “listening”. I started my “morning sickness” (must be a man who coined that phrase!) two days before I found out that I was up the duff, but had put it down to un-wise breakfast choices (surely eating chocolate cake for breakfast causes nausea?!). The nausea then arrived with a vengeance, and I seemed to live solely on Marmite toast, bananas and satsumas. The toilet and I became almost inseparable friends. And my poor husband had to deal with my newly hypersensitive sense of smell… He bore it like a trooper. I couldn’t stomach any cooking smells whatsoever (though garlic and fish were by far my biggest aversions) and he was banished from my vicinity until the smells had stopped clinging to his clothes. It was so bad that even the smell of boiling pasta (essentially just hot salty water) made my stomach turn! Luckily, the nausea has mostly settled now. I can deal with the odd bit of sickness without too much fuss. My first trimester also saw my fatigue symptoms worsen, although I was expecting that to be the case. There were days when an 11am nap just couldn’t be avoided. My ME/CFS specialist kept re-iterating at my last appointment, that good sleep hygiene meant NOT sleeping in the day… I just inwardly rolled my eyes, and thought that it was perhaps not such practical advice coming from a MAN – what would he know about being so tired that I wanted to scratch m eyes out! He did encourage me by saying that in his experience, the second trimester usually means significantly improved energy levels in women with ME/CFS. Here’s hoping! I’ve had a few comments about the timing of the pregnancy, with my symptoms being as bad as they are. I’ve tried to ignore these as far as possible, as Chris and I DID discuss the implications of pregnancy and a baby BEFORE we started trying! Give us a little credit folks! We came to the conclusion that if we waited for a “better” time, we might never start a family… My ME/CFS can be so unpredictable, that who knows what it would be like in 9 months time… I have realised that we’re just going to have to take things one day at a time, and make things up as we go along when baby arrives…none of the “what to do with a new baby” books are written with ME/CFS parents in mind, so we’ll have to figure things out as we go along. Of course I have moments of panic when I think about having to cope with a baby (and then an active toddler!) on my own during the day while Chris is at work. I’d be delusional if I didn’t worry about it. But I’ve discovered a ME/CFS Parents Message Board online, and it’s brilliant to get in touch with other women who are pregnant and have ME/CFS (or have had kids while suffering from ME/CFS)… It’s helped me to feel less alone in this forray into the unknown! Once again, thank goodness for the internet! I had a bit of a scare the night before last, as I started bleeding, with small clots being passed yesterday morning. I called the out-of-hours GP service and was booked in for an emergency scan/check-up yesterday at the local early pregnancy clinic. I was so worried that there was something wrong, but luckily the scan showed Little Bean waving, kicking and squirming, totally oblivious to panic on my part! I was told it was probably bleeding from my cervix, and as I’ve never gone through this before, I’ll take their word for it! Anyway, I’ll call it a day here, but I’ll be back blogging again soon…now that I can share my pregnancy with the world at large!